With the shifting of DAV Sanjauli school and merging it into DAV New Shimla from this academic session, some 5000 students now travel to and from the school in buses and taxis and private cars to bring the traffic to a virtual halt every morning and closing time. The traffic moves at a snail’s pace between the BCS chawk to the school in Sector -4. During school hours it takes about one hour to travel a distance of just 3 kms. Added to the increased traffic movement is the problem of increasing road side car parking’s all along the route. Despite traffic challans frequently affixed on the wind screens, the residents perhaps have no alternative but to park them on the road sides. A few days ago a traffic bottleneck at BCS Chawk was eased with the shifting of local bus stops a few yards further each side. Courtesy the initiative taken by a high court justice caught in traffic jam in New Shimla and being forced to walk to the byepass road. The lone traffic cop posted there could hardly make the local buses move as they also halt to wait for passengers. The bus drivers’ unruly behaviour is obviously also backed by political patronage they enjoy. 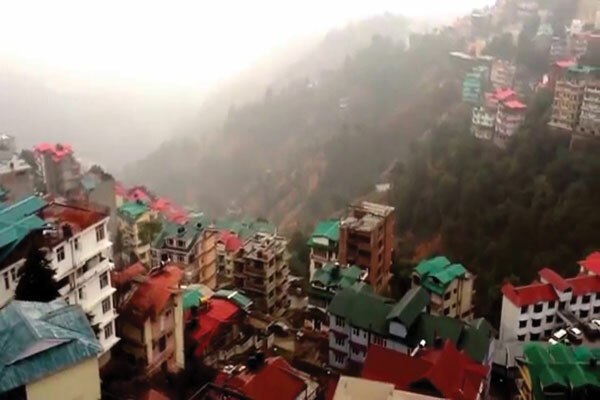 The roads in New Shimla had been designed by the HIMUDA, the building authorities, some 35 years ago to make way for a decent township proposed for a limited number of houses and flats. However, over a period of time, the common areas and parks were also usurped to make way for some more plots for the big wigs. Little did they realise that the private land left unacquired in the area, and the nearby villages will too be turned into housing complexes by builders soon. The new areas now tend to bring more vehicles on the narrow roads of New Shimla. So much so that the so called New Shimla is gradually loosing it’s sheen to become another congested lower Bazar of Shimla. Burgeoning to the seams…. like the very population of the country. With a single entry and exit road to the congested area, in case of natural disaster the rescue vehicles too may not be able to make way to the needy. God saves the residents of such an eventuality! Traffic snarls have now spread to the hills . A solution is to use carpools and buses instead of private cars. dont understand your Language..can we communicate in English?